Sentosa, the land of fun is now extra thrilling as AJ Hackett joins the family! 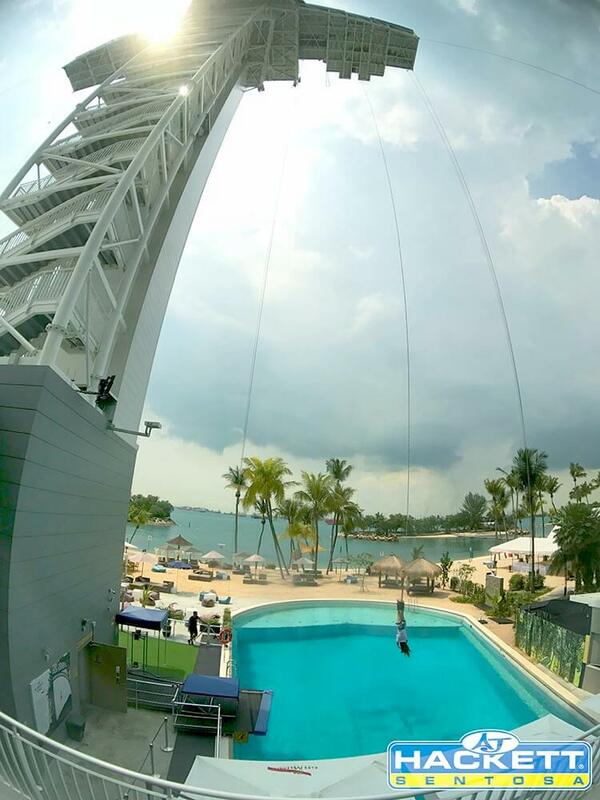 Known for its Bungy Jump, folks who are fans of adrenaline-rush can now get your thrill-craving fixed at their 50m roof jump. Located at the Siloso Beach, jumping off the deck comes with a breathtaking view of the emerald sea. There’s a pool underneath the tower so jumper could opt to stay dry or dipping half of your body into the water for that extra fun and dramatic effect in the video taken. Besides Bungy Jump, there’s also the world’s first dual Giant Swings which I personally found scarier than the Bungy Jump. Swingers are pulled from ground to the tower away from the beach and released when they reached 40m high. The thrill is that the Giant Swing goes 120km/hr. 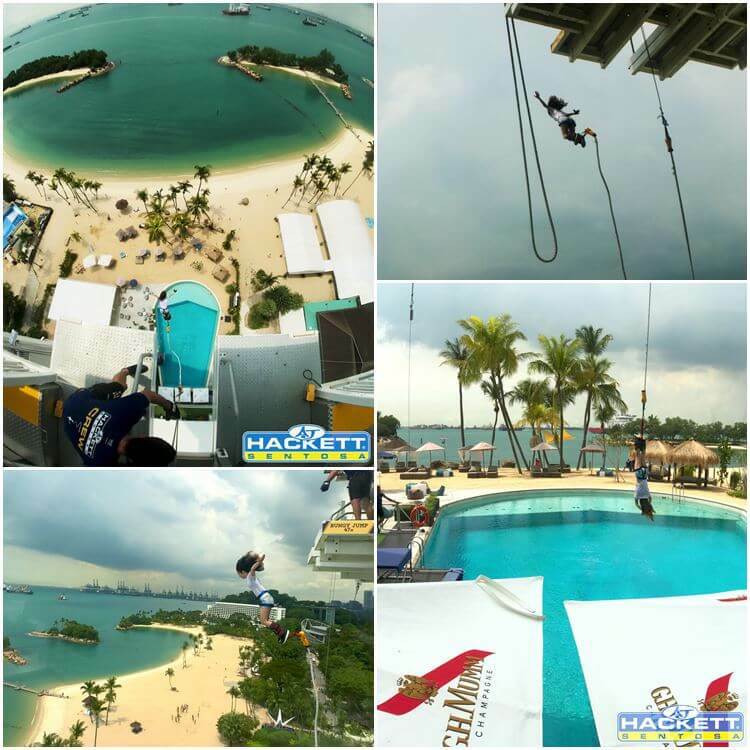 Accommodating 1 to 3 people at a time, the giant swing allows swingers to enjoy the thrill as well as beautiful view of Siloso Beach with their loved ones. You might have seen it in movies or tried it yourself if you were enlisted to be part of the National Service, there’s also Vertical Skywalk available here! 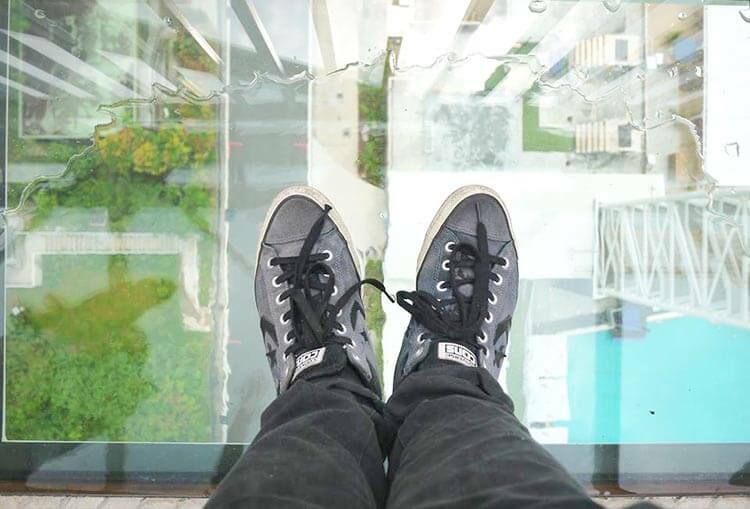 First in Singapore, the skywalk is also taken place at the 50m tower where walkers are hang on the harness while walking vertically down from the tower to the ground. The least scary among all three activities, this is great for one who wants to get over their fear of heights. All activities come with a video camera strapped on the wrist, capturing all emotions – fear especially while one is on it. The videos and photos taken during the activities are available for purchase. If all those thrilling activities are not for you, go for walk on their Skybridge! Crossing two towers 47m above ground, challenge yourself to stand at the see-through glasses on the bridge. To take things to the next level, step into the Glass Cube on the Skybridge to overcome your fear of vertigo! If all you want to do is to watch people doing the activities, there’s an alfresco area at the beach with beanbags and proper chairs as well as tables serving food and drinks! It’s normal for first-timer to be skeptical of the safety of such activities but fret not as they have been doing this since 1986, serving 3.5mil customers! Besides all Jump Masters are certified, they make their own bungy cords and to reassure you, the cords are usually disposed after five uses but at AJ Hackett, they dispose the cords after 3 uses. That said, safety is extra guaranteed! Whether you’re a thrill-seeker or not, there’s something for everyone here. For more information or bookings, call +65 6911 3070 or e-mail to sentosa.info@ajhackett.com. Next article5 Reasons the HUAWEI Mate 10 Series is your perfect Christmas Mate! Jennifer is a bubbly girl who lives for the little things in life. She might seem unapproachable at first but trust me, she’s a dork. Her eyes sparkle whenever she sees food and traveling feeds her soul.